I made these for our New Year’s dinner with pork chops and green beans. Everyone loved them! 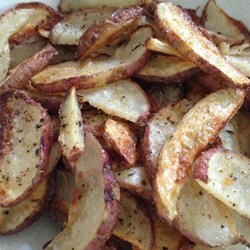 Spread potato wedges in a single layer on a baking sheet and coat with olive oil. Mix onion powder, chili powder, garlic powder, and garlic salt in a small bowl; sprinkle over potatoes and toss to coat evenly. Bake in preheated oven until potatoes are tender, 30 to 35 minutes. Season with salt and black pepper.